The hosts thankfully get way past "jawn" and "wooder ice"
North Broad Street and the Philadelphia Skyline. 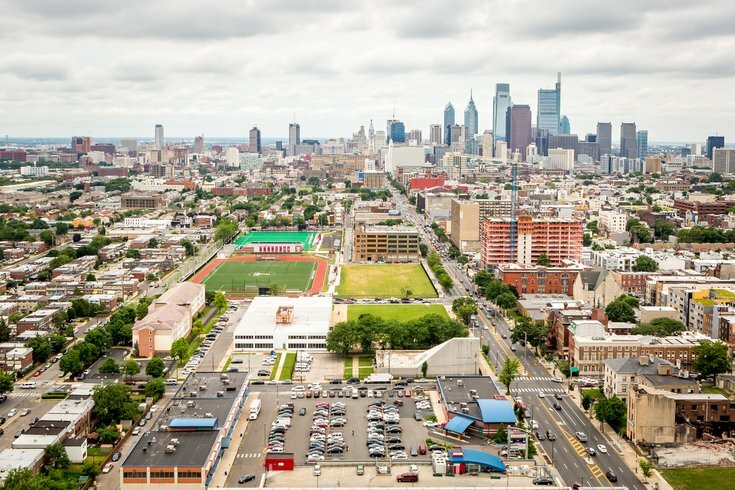 Philadelphia’s accent is unmistakable, and it’s often a source of pride among residents. What if you understood it better? Would you want to know what makes a Philly accent work the way it does? One linguistics podcast, “The Vocal Fries,” took that dive for us in an episode titled “How Millennials are Destroying the Philly Accent.” That’s a real clicker! The podcast chatted with Betsy Sneller, who did her Ph.D. research at Penn, about what she calls Philadelphia English. The segment starts with some pretty typical Philly accent fare — they take brief tours through “jawn” and “youse” and “wooder” — but it gets interesting when they start talking about the Philadelphia A. MORE: South Street's Magpie is closing after six years and 30,000 pies | Poll: Is deli cheese a lunch meat? Sneller says Philadelphia English’s version of the split short-a system is one of the most complex in English, so you can flaunt that over anyone who thinks Philadelphians talk funny. • The way a person pronounces the word “family” could indicate they hail from Philadelphia … or from Montreal? • The Philadelphia English dialect region extends all the way down into Baltimore! The entire podcast is worth a listen. Maybe with a nice, tall glass of wooder.